Ms. Wilkinson who commented: Great idea! Thanks! 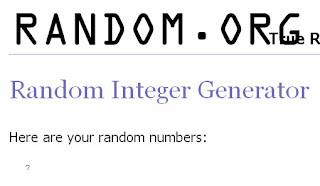 Congratulations and I will contact you by email! Thanks to everyone who took the time to enter and leave such wonderful comments. This was so much fun that I will have to host another giveaway in the near future! Thank you to Elmer's for giving me the opportunity to hold this wonderful camp and for the really cool supplies. I still plan on sharing all the fun we had at our camp. Don't forget, you can find most of the items at many of your local stores. Continue creating, teaching and learning and many thanks for coming by! This is the lesson plan for a class I was going to teach this weekend but I am doing a mud run and thankfully got another instructor to cover the class for me (Thanks Ms. Amanda!!) The kids love her and I am sure she will add her own creative touch to this class. Why gears? Well the OKCMOA has an incredible exhibit right now that you might have seen traveling through your town, 1934: A New Deal For Artists. The first part of the exhibit is about industry and what better way to talk about industry than machines and gears! 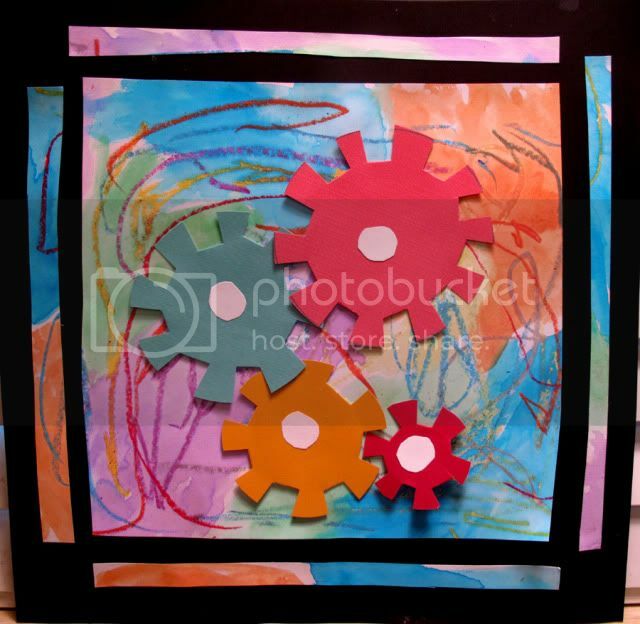 Gears are fun, they make a lot of things go, just have your kids look at some of their toys. I found some books at our library and this great video. The first step was some prep work. I actually traced circles of different sizes for each student as they are 3-5 years old. 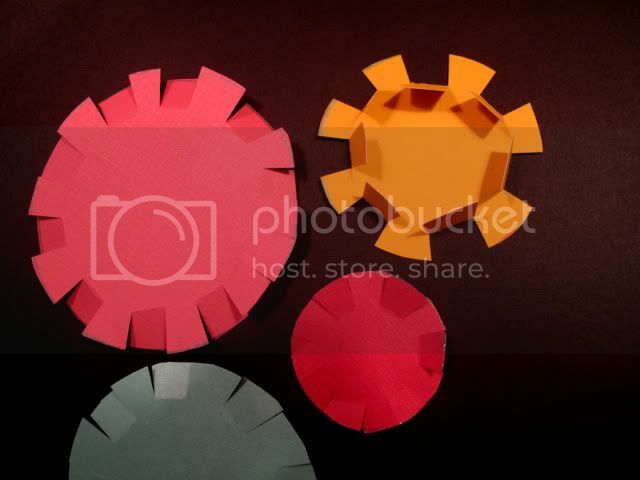 Your students and children can freehand circles or use a template like I did. Now we cut our circles out. To give our gears teeth we make an even number of little cuts around the circle. Now we fold back every other tooth. 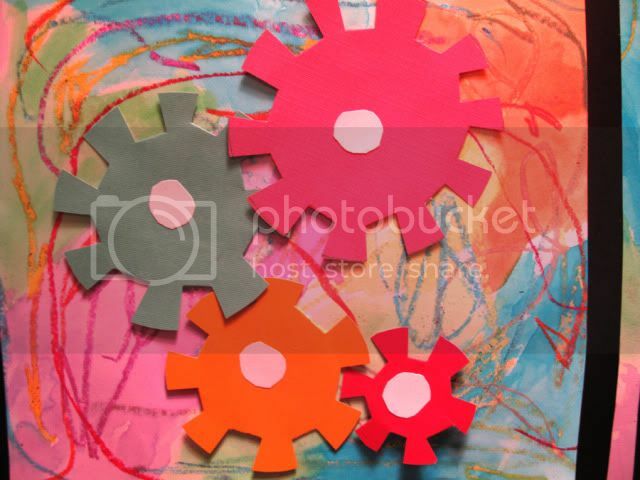 Set gears aside and prepare background. 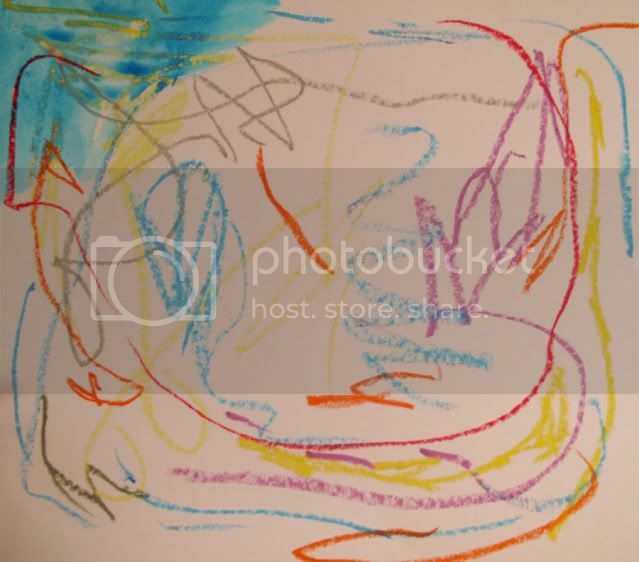 First we use oil pastels. 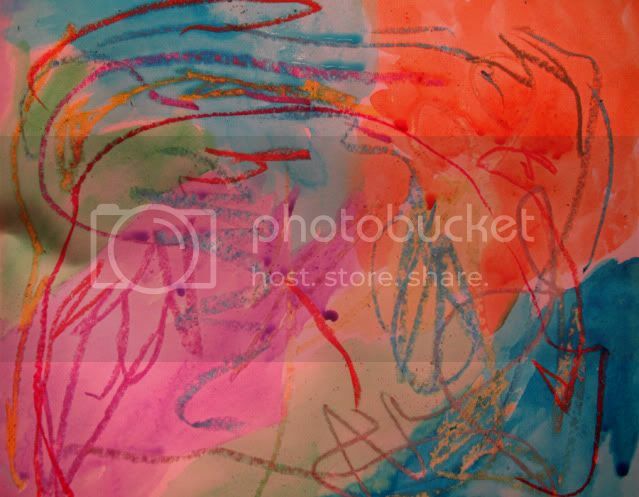 Then use a watercolor wash to fill our paper. Now we use our glue stick to cover the back of our gears and press and hold. You need to use quite a bit of glue and press and hold, hold, hold. I usually tell kids to press, hold and count to five. Arrange gears over paper and we trimmed a small strip from each side of our final work. We glued down our big piece down on black paper and finished by gluing the strips around the piece with a little space left between the piece and the strips. Hello readers! 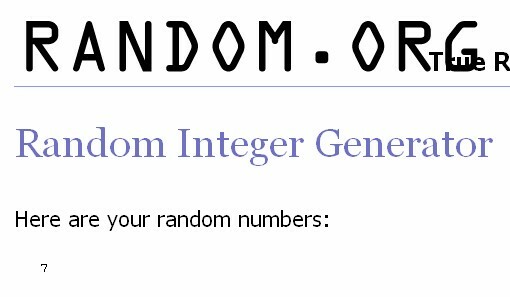 Welcome to my very first giveaway! Let me give you details. 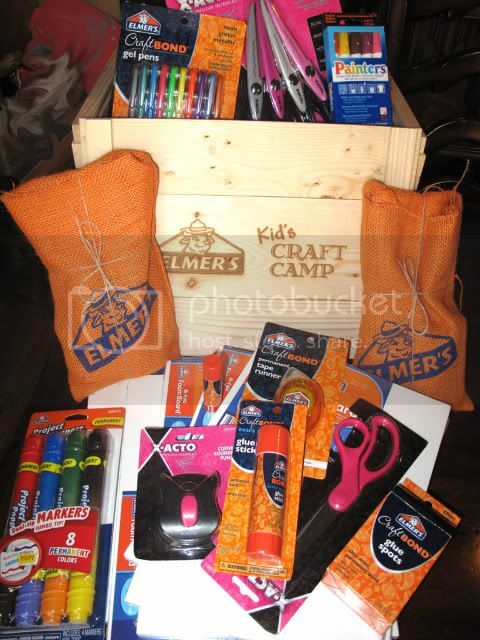 I was contacted by Elmer's to see if I would be interested in hosting a Kid's Craft Camp. (YES!) They sent me a really cool box filled with all sorts of goodies to create with. 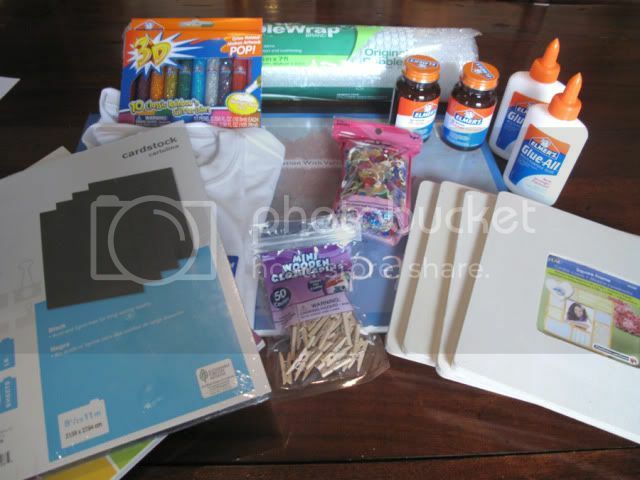 They also gave me a giftcard to purchase other supplies for the camp. The giftcard is not part of the giveaway but I purchased items you probably already have at home. 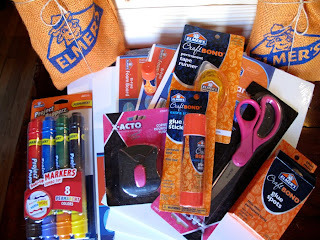 I know you all have used Elmer's school glue like I have since you were a child, but did you know about all of their other products? I didn't! This gave us a chance to experiment with new (to me) products and we had a ton of fun. This week I will be posting projects from my Kid's Craft Camp. 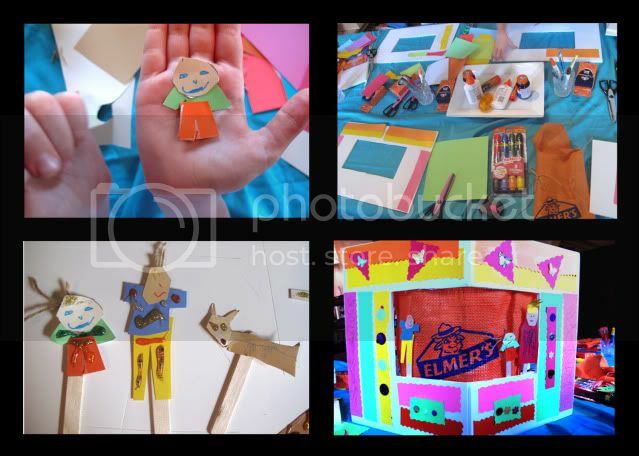 Our first project was creating a puppet show. Details on this project and more all week long! 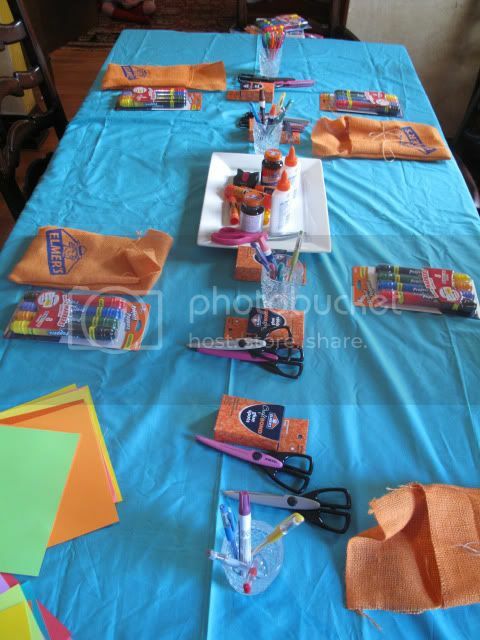 You can make these fun ideas at home too but it will be a lot more fun if you win this giveaway generously donated by Elmer's to one lucky reader. For extra chances to win, share this on FB or Twitter and come back here to tell me you did. Giveaway ends Friday, July 29th at Midnight est. I will post winner and contact by e-mail. Packaging may differ from what is shown here. Good Luck and stay tuned for projects from our party!